George Lopez (born April 23, 1961) is an American comedian, actor, and talk show host. He is mostly known for starring in his self-produced ABC sitcom George Lopez. 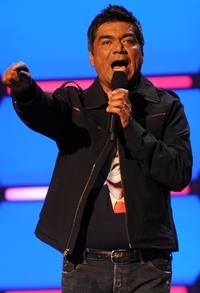 His stand-up comedy examines race and ethnic relations, including Mexican American culture. He was the host of the late-night talk show Lopez Tonight on TBS until its cancellation on August 12, 2011. This webpage uses material from the Wikipedia article "George_Lopez" and is licensed under the GNU Free Documentation License. Reality TV World is not responsible for any errors or omissions the Wikipedia article may contain.